The neurological complications of HIV infection remain poorly understood. Clinically, in vivo 1H magnetic resonance spectroscopy (MRS) demonstrates brain injury caused by HIV infection even when the MRI is normal. Our goal was to undertsand the dynamics of cerebral injury by performing a longitudinal in vivo 1H MRS study of the SIV/macaque model of neuroAIDS. Eight rhesus macaques were infected with SIVmac251 and serially imaged with MRI and 1H MRS to terminal AIDS or the endpoint of 2 years. During acute infection, there were stereotypical brain MRS changes, dominated by a significant elevation of the Cho/Cr ratio in the frontal cortex. Subsequently, brain metabolic patterns diverged between animals. 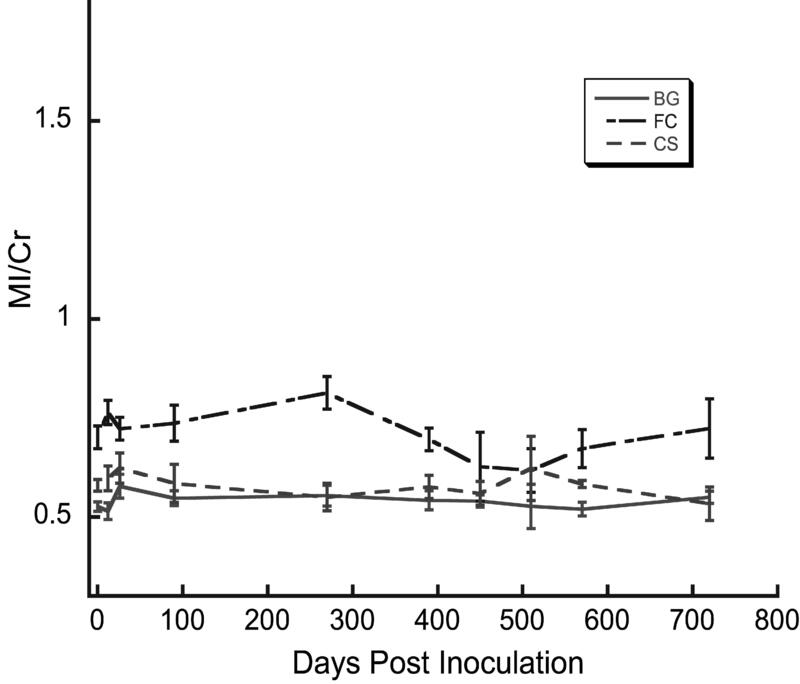 There was an elevation of basal ganglia Cho/Cr four weeks post-inoculation in 2 animals that developed SIV encephalitis (p = 0.022). Metabolite ratios averaged across all 8 animals were not significantly different from baseline at any time point after 2 weeks post inoculation. However, linear regression analysis on all 8 animals revealed a positive correlation between a change in frontal lobe Cho/Cr and plasma viral load (P < 0.001, R = 0.80), and a negative correlation between NAA/Cr in the basal ganglia and the plasma viral load (P < 0.02, R = -0.73). No MRI abnormalities were detected at any time. After infection with SIV, macaque brain metabolism changes in a complex manner that is dependent on brain region, host factors and viral load. An elevation of basal ganglia Cho/Cr 4 weeks after SIV infection may be marker of a propensity to develop SIV encephalitis. Elevations of Cho/Cr, often observed in CNS inflammation, were associated with increased plasma viral load during acute and chronic infection. Evidence of neuronal injury in the basal ganglia was associated with increased plasma viral load in the chronic stage of infection. These observations support the use of drugs capable of controlling the viral replication and trafficking of virus into the CNS, and may help explain the reduction in incidence of HIV-associated dementia in the era of HAART despite the inability of most of those drugs to effectively enter the CNS. The pathogenesis of brain injury in HIV infection remains incompletely understood. Elucidation of the pathogenesis of HIV brain injury is confounded by major uncertainties in humans, such as time of infection, variable treatments, and lack of access to brain tissue for evaluation. Neuroimaging has helped in understanding HIV related brain injury, and in recent years in vivo 1H MR spectroscopy has emerged as amongst the most informative method [1–11]. Brain MRS abnormalities in HIV have been widely reported, but studies have been limited to the chronic stages of HIV infection. To our knowledge, only one longitudinal MRS study of untreated, chronically HIV infected subjects have been reported . Brain abnormalities that may occur during the acute and subacute stages as well as their relationship to chronic HIV infection are unknown. The SIV-infected macaque is an excellent animal model for studying the neuropathogenesis of HIV-related brain injury [13, 14], and 1H MRS may be used repeatedly in the same animal to follow brain abnormalities from early to late stages. In vivo macaque brain 1H MR spectra are similar to humans , and post mortem MRS studies from SIV-infected macaques have revealed metabolic abnormalities similar to those observed in chronically HIV-infected human brains by in vivo MRS [15, 16]. Significantly, cerebral injury is observed by in vivo 1H MRS  as well as by in vitro 1H MRS and neuropathology shortly after SIV infection [15, 16]. It is not known whether full recovery occurs, or whether these cerebral abnormalities persist into the subacute and chronic periods. One puzzle is that while virtually all SIV-infected macaques demonstrate cerebral injury acutely, fewer than a third ultimately develop SIV encephalitis (SIVE) . Our previous observations of early brain injury in the SIV-infected macaque led to the investigation reported here [15, 16]. Our previous MRS studies were performed only on post mortem frontal cortex samples using solution 1H MRS of brain extracts  or high resolution magic angle spinning 1H MRS and neurohistochemistry of brain tissue samples . Those studies revealed evidence of frontal cortex neuronal injury with declines of the MRS neuronal marker N-acetylaspartate (NAA) [15, 16], and the neurohistochemcial neuronal markers synaptophysin and calbindin. An important limitation of this previous work was that the brain samples were only from animals that had been euthanized within 2 weeks of infection, or at terminal AIDS. Thus, the events that may occur in the brain and are detectable by MRS between the very early and late periods of infection were unknown, and form, in part, the rationale for the present study design. Another issue arising from our previous in vitro studies was that we failed to detect expected increases in the choline-containing compounds (Cho) and myo-inositol (MI) that are commonly seen HIV infected patients [5–11]. In the study that we report here, we sought to understand whether brain injury in the SIV-infected macaque is detectable by in vivo 1H MRS in the subacute and chronic periods after infection, whether there are metabolic brain markers that predict the development of SIV encephalitis, and whether there are relationships between traditional clinical markers and brain MRS abnormalities. In a cohort of 8 macaques, we noninvasively evaluated the effect of SIVmac251 infection on the macaque brain by MRI and 1H MRS in a prospective, longitudinal manner. The longitudinal in vivo 1H MRS study that we report here is an extension of a study in which 15 rhesus macaques were inoculated intravenously with SIVmac251 and imaged during the first month of infection . Seven of the animals were euthanized within the first month of infection, and the remaining 8 macaques were followed longitudinally until euthanized because of terminal AIDS or the two-year study endpoint. We define 3 time periods with respect to infection: acute (within a month), subacute (between 1 and 3 months), chronic periods (beyond 3 months). Details of animal age, survival and pathological findings are summarized in Table 1. Two of the 8 animals developed SIV encephalitis (SIVE) as defined by the presence of perivascular infiltrates of macrophages and multinucleated giant cells. Four of the 8 animals where terminated before 2 years after SIV inoculation due to terminal AIDS. Two of the 4 early-terminated animals were the ones that also had SIVE. The other 2 animals that were terminated early had evidence of mild CNS pathology, but not SIVE. Four macaques survived to the designated two-year end point, and none displayed CNS pathology. Obvious neurological deficits such as paralysis or seizures were not observed in any of the animals by the veterinarians caring for the animals. Formal neurological examinations were not performed. Serial MR imaging and spectroscopy studies were performed before and after SIV inoculation on a clinical MR instrument (1.5 T). A total of 57 scans were performed on the cohort. The number of scans that were performed in an individual animal varied from 4 to 10 scans, depending on time of survival. A neuroradiologist reviewed all brain MR images. No brain MRI abnormalities such as masses, abscesses, fluid collections, hemorrhage, white matter signal abnormalities or infarcts were detected in any animal before or at any time after SIV infection. In vivo 1H MR spectroscopy was performed using a protocol that has been validated for multicenter studies of HIV infected patients . We have previously reported the details of the normal macaque brain MR spectrum that is very similar to the human brain MR spectrum . An axial T2 weighted MR image demonstrating frontal lobe voxel placement, and an MR spectrum from that location is shown in figure 1. The macaque brain MR spectrum demonstrates high quality in terms of spectral resolution and signal-to-noise ratio, and is similar to human MRS data obtained using the same protocol . Representative in vivo 1H MR spectrum from the frontal lobe. The spectrum was obtained from the location indicated in the figure inset and measures 1.5 × 1.5 × 1.5 cm3. The spectrum was acquired using a PRESS sequence (TE = 35 msec, TR = 3000 msec) with CHESS water suppression. Displayed on the spectrum are the metabolites utilized for the study and include NAA (N-acetylaspartate), Cho (choline-containing metabolites), Cr (creatine + phosphocreatine) and MI (myo-inositol). We examined changes in the brain in MRS resonances commonly designated as N-acetylaspartate (NAA), choline (Cho), myoinositol (MI) and creatine (Cr). MR spectra were obtained from the frontal cortex, centrum semiovale and basal ganglia, before infection and at multiple time points after infection. The time points include 2 weeks, 4 weeks, 3 months, 13 months, 15 months, 17 months, 19 months and 24 months post inoculation (pi). The average values from all animals imaged at each time point for the major metabolite ratios from each anatomic location acquired across the duration of the study are displayed in figures 2, 3 and 4. While each animal was scanned for up to 2 years, the study took place over 3 years. Instrumental stability was confirmed through analysis of MRS data from a phantom containing NAA, Cr, Cho and MI acquired the same day as the animal studies. Across the 3 years of the study, the standard deviation of the phantom Cho/Cr was 2.7%, the NAA/Cr standard deviation was 3.0%, and the MI/Cr standard deviation was 5.8%. Regression analysis demonstrated a slope of <0.001% for each metabolite ratio versus time, i.e., there was no detectable change over time in phantom metabolite ratios. These data confirm instrumental stability across the 3 year duration of the study. Longitudinal cerebral Cho/Cr ratios in SIV-infected macaques. Data were derived from MR spectra from 3 cerebral locations. BG represents scans taken in the basal ganglia region, FC represents scans taken in the frontal cortex, and CS represents scans taken from the centrum semiovale. Error bars represent the standard error of the mean (SEM). Asterisks represent statistically significant metabolite ratio differences compared to pre-infection values. All eight animals were scanned at every time point through 90 dpi. After this time: 270 dpi represents 6 animals, 390 dpi 5 animals, 450 dpi 3 animals, 510 dpi 4 animals, 570 dpi 3 animals, and 720 dpi 4 animals. Cho/Cr values obtained from the frontal cortex were significantly higher than baseline values at two weeks post inoculation (* P < 0.05) and was followed by a sharp decline to below baseline at 4 weeks post inoculation (** P < 0.01). Cho/Cr in the other regions displayed similar, albeit non-significant changes in the first four weeks following infection. The inset plot in the Cho/Cr figure expands the first 4 weeks after infection. For all of the regions ANOVA revealed no statistically significant changes in the chronic phase of infection (>28 dpi). Longitudinal cerebral NAA/Cr ratios in SIV-infected macaques. Values of NAA/Cr obtained from the three measured regions are displayed. ANOVA revealed no significant changes for the three regions. Experimental details and plot legends as in Figure 2. Longitudinal cerebral MI/Cr ratios in SIV-infected macaques. Values of MI/Cr obtained from the three measured brain regions are displayed. For the duration of the study ANOVA revealed no significant changes in the ratios for the three brain regions. Experimental details and plot legends as in Figure 2. We found in this cohort a significant increase in frontal lobe Cho/Cr 2 weeks post inoculation (p < 0.05), a time coincident with viral neuroinvasion and increased numbers of perivascular macrophages [5, 19, 20]. These changes were also observed in the entire 15 animal cohort of the acute SIV infection study . 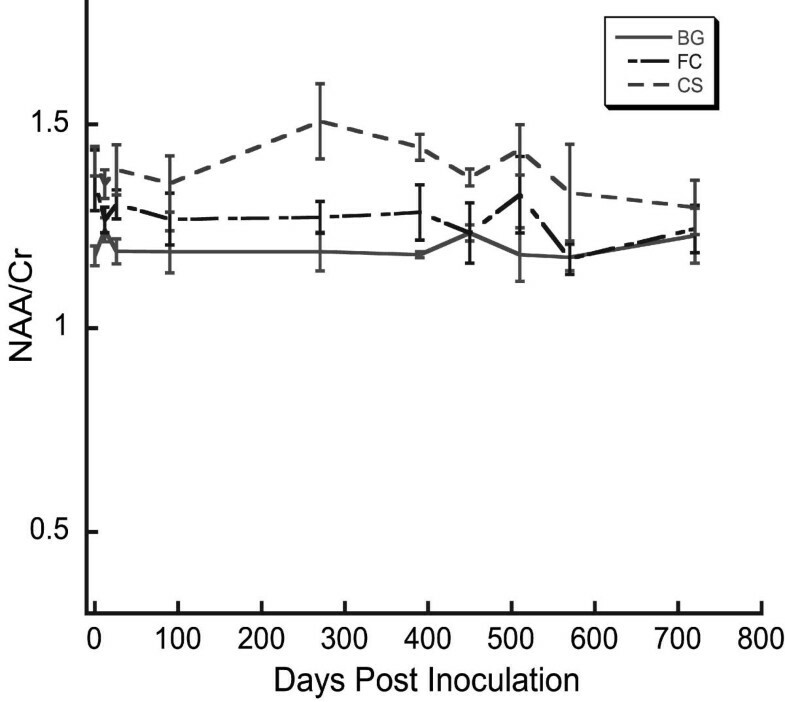 This was followed by a decrease to below baseline at four weeks post inoculation (p < 0.01) as shown in figure 2. Subsequent to the acute period, some variation in Cho/Cr with time is apparent in figure 2, but we found no statistically significant difference between pre-infection mean values and any other post infection time point mean values in any of the brain regions. We did not detect statistically significant differences in NAA/Cr (figure 3) and MI/Cr (figure 4) in any of the brain regions under investigation after SIV infection compared to pre-infection values at any time point. In the 15 animal cohort studied during the first month after SIV infection, we detected statistically significant transient decline in NAA/Cr and an elevation in MI/Cr in the frontal cortex. Restricting data analysis to the 8 animals followed longitudinally did not provide sufficient statistical power to detect significant changes in NAA/Cr or MI/Cr. A major goal of this study was to investigate whether there are metabolic brain markers that predict the development of SIV encephalitis. We found that there was a significant difference in the Cho/Cr ratio in the basal ganglia (p = 0.022) between encephalitic and non-encephalitic animals at four weeks post-inoculation as shown in figure 5. In both groups of animals there was an initial rise in Cho/Cr within 2 weeks of infection, but the elevated levels persisted at 4 weeks only in those animals that eventually developed encephalitis. In all other animals, the Cho/Cr ratio dropped substantially after the period of peak viremia (11–13 dpi). After 3 months, however, the Cho/Cr values of the encephalitic animals were indistinguishable from those of the non-encephalitic SIV-infected macaques. 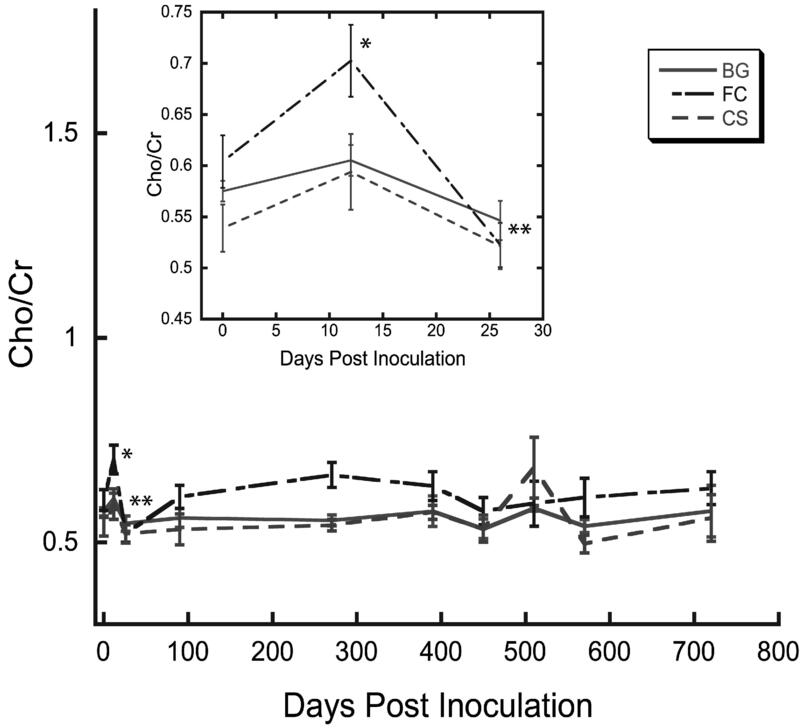 Basal ganglia Cho/Cr ratios obtained four weeks after infection in animals that subsequently developed SIV encephalitis and those that did not. Error bars represent the standard error of the mean (SEM). A t test was performed assuming equal variances between the two groups of animals. A test to determine whether the variances between the two groups of animals were different proved not to be significant. Animals that later were found to have SIVE (encephalitic) (n = 2) had higher Cho/Cr compared to the other animals (n = 6) (P = 0.022). A further goal in this prospective study was to evaluate relationships between changes in blood/plasma measurements and brain metabolite changes. For this evaluation, only blood/plasma samples obtained within 24 hours of scanning were considered. 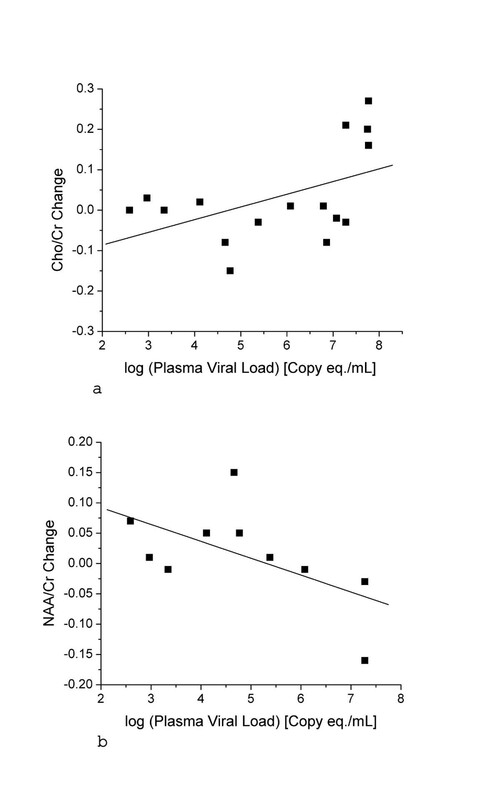 The relationship between a change in frontal Cho/Cr and plasma viral load is shown in figure 6a. We observed a significant correlation between these parameters (p < 0.001, r = 0.80). Evaluating MRS data collected after the acute phase (>30 days post-inoculation), a significant negative correlation was found between the change in basal ganglia NAA/Cr and the plasma viral load (p < 0.02, r = -0.73). This relationship is illustrated in figure 6b. Correlations between the plasma viral load and metabolite ratios in the frontal lobe and basal ganglia. All values are changes from pre-infection measurements. 6a: Plasma viral load vs. Cho/Cr in the frontal lobe for the entire duration of the study. Regression analysis revealed a statistically significant linear correlation (P < 0.001, R = 0.8). 6b: Plasma viral load vs. NAA/Cr for the chronic phase of the study (>4 weeks) in the basal ganglia. Regression analysis revealed a statistically significant negative correlation (P < 0.02, R = -0.73) The line represents the least squares fit. We did not detect other correlations between brain metabolite ratios and other blood/plasma measurements. In particular, we did not find a correlation between lymphocyte subsets (CD4+, CD8+) and brain MRS measurements. However, we did observe substantial variations in the levels of these lymphocyte subsets over time in the individual macaques. The most notable changes were declines in CD4+ lymphocytes to very low levels in the 2 animals that developed SIVE. This is the first longitudinal neuroimaging study of human or nonhuman primates that begins before infection by an immunodeficiency virus, and continues through to the development of encephalitis. In a cohort of 8 rhesus macaques, we serially performed in vivo 1H MR spectroscopy and MRI with the goals of demonstrating whether brain injury in the SIV-infected macaque is detectable noninvasively, whether there are metabolic brain markers that predict the development of SIV encephalitis, and whether there are relationships between traditional clinical markers and brain 1H MRS abnormalities. While MRI appeared normal, novel metabolic abnormalities were observed, and they provide new insights into the response of the CNS to SIV infection that are relevant to HIV infection in humans. The 1H MRS changes seen shortly after infection were expected. Previous work from our laboratory documented similar findings by MRS both in vivo  and in post mortem studies [15, 16]. Our observations during the subacute and chronic stages of SIV infection are new. Our most interesting finding was an elevation of Cho/Cr in the basal ganglia four weeks post-inoculation in the 2 animals destined to develop SIVE, whereas the other 6 animals had basal ganglia Cho/Cr values below baseline (figure 5). SIV-induced neuropathological changes are variable with SIV encephalitis developing in 25% of infected macaques , similar to the incidence of encephalitis in HIV-infected humans, and the rate of SIVE in the present study. It is not clear why there is a spectrum of individual responses to infection with the same virus. The most likely explanations include viral mutation and the differences in host factors. Throughout the course of infection there is a high rate of mutation [21–24]. Our data supports an important role for host factors; at 4 weeks pi, when minimal viral mutation is expected, we found a clear difference in the basal ganglia Cho/Cr ratio between those macaques destined to develop SIVE and the others. We suggest that the observation of persistent basal ganglia Cho/Cr elevation during the first month after infection is a marker of host susceptibility to SIVE. If confirmed, it may have important implications for design of further research, and potentially in the clinical management of patients. To our knowledge, the only other biomarker with the potential to predict encephalitis is elevated levels of macrophage chemoattractant protein-1 (MCP-1) in the CSF for development of SIVE . However, the MCP-1 finding was observed in an accelerated SIVE model that employs 2 viruses, results in a high rate of SIVE, and is quite different from the human situation. If persistence of elevated cerebral Cho/Cr is found to also be a predictor of a neurocognitive disorder in HIV-infected patients it could become an important clinical tool. For example, it may be used to identify individuals that may benefit from early, CNS-targeted or more aggressive administration of antiviral, anti-inflammatory, and neuroprotective agents. Prior studies have demonstrated viral neuroinvasion in the weeks following infection [20, 26]. Brain abnormalities have been documented by in vivo 1H MRS , in vitro 1H MRS [15, 16], and neuropathology  in post-mortem tissues obtained within 2 weeks of infection. In the present study, we again observed abnormalities in vivo, specifically, elevation of frontal lobe Cho/Cr at the time of peak viremia (2 weeks pi), and a diminution of this ratio to below baseline at 4 weeks pi, after the immune system responded to the virus. An elevation of Cho/Cr is often observed in CNS inflammatory processes, and is seen in HIV infected patients before evidence of neuronal injury or neurocognitive symptoms [2, 4, 5, 27]. 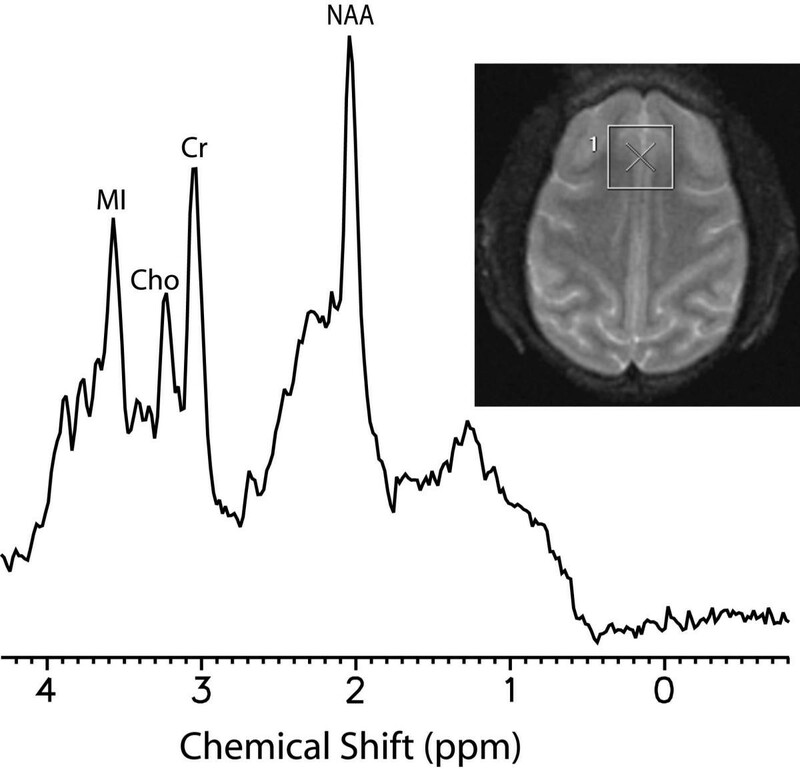 While a marked astrogliosis was observed in post-mortem tissue , elevations of the choline-containing metabolites in the in vitro MR spectra were not [15, 16]. Thus, in vivo Cho/Cr elevation appears to be related to astrogliosis, but levels of choline-containing compounds measured by MRS in vitro do not correlate. These findings are curious, and suggest that there is a poorly understood contribution to the Cho resonance measured by 1H MRS in vivo that requires further study. Our observation of a positive linear correlation between plasma viral load and changes in frontal Cho/Cr during both the acute and chronic periods (figure 6a) is a new finding that may help to illuminate the CNS response to SIV. The brain viral inflammatory process induced by the virus may progress in at least 2 ways . The virus may enter the CNS shortly after infection, and continue to replicate there, producing a chronic, progressive inflammatory process that ultimately leads to neurodegeneration. Alternatively, virus may be largely cleared from the CNS after the initial viremia is controlled by the immune system, and cerebral inflammation returns only when there is loss of immunological control and recurrence of viremia. Our findings illustrated in figure 6a support a third proposition: brain inflammation tracks, and is directly related to blood levels of the virus which may peak from time to time, even before the onset of AIDS. We did not detect reduced NAA/Cr as a function of time after infection in this longitudinal study (figure 3). We have previously observed declines in NAA/Cr 2 weeks after infection using in vivo  and in vitro 1H MRS [15, 16]. The most likely explanation is that SIVE was infrequent, and CNS disease was mild on average across the 8 animals. Thus NAA changes were too subtle to be detected in this small cohort by in vivo 1H MRS at 1.5 T. Indeed in our previous in vivo 1H MRS study , we found changes in NAA at 2 weeks, but a total of 15 animals were studied. This conclusion is also supported by human studies. The imaging protocol we employed in this study is identical to one used in a multicenter study of HIV infected subjects . That study detected a small difference in NAA/Cr, but required 15 HIV- and 38 neurosymptomatic, HIV+ subjects . Other in vivo MRS human studies demonstrating decreased NAA/Cr performed at 1.5 T also employed larger numbers and more advanced disease [1–3, 6, 8, 10, 27, 29, 30]. Variable progression of CNS disease in individual primates may also explain our inability to detect NAA/Cr change as a function of time after infection. If CNS injury in AIDS is characterized by different rates of neuronal injury progression alternating with periods of remission, the averaging of measurements at specific time points within a small cohort would mask evidence of brain injury. We mitigated the effects of temporal averaging by comparing brain metabolite levels with plasma viral load in individual animals, and found evidence of brain injury in the subacute and chronic periods of infection. As illustrated in figures 6a and 6b, SIV viremia significantly correlated with elevated frontal lobe Cho/Cr and decreased basal ganglia NAA/Cr. These correlations between plasma viral load and brain metabolites during the chronic phase of SIV infection suggests that CNS injury is dependent on the presence of the virus, most likely transmitted into the CNS by the trafficking of SIV-infected monocytes [19, 31–33]. The issue of variable response by different brain regions in response to SIV infection merits comment. Such variation in HIV-infected individuals has been reported by many groups [4–11]. We also find regional variations in the SIV infected macaque brain. We found that at 2 weeks pi the changes in Cho/Cr ratio appear greater in the frontal cortex than other areas. We do not know the situation in the human condition because such studies have not been reported in the early post infection stage. After the 2 week period, neuronal injury was more evident in basal ganglia than in other brain regions in the macaque, similar to human studies . It is possible that the tropism of the virus may change with time. That is, it is possible that early metabolic changes are prominent in the cortical regions and only later are they more prominent in the basal ganglia. We monitored the brains of SIV-infected rhesus macaques with in vivo 1H MR spectroscopy longitudinally for up to two years. While no MRI abnormalities were detected, metabolic changes were observed by MRS. During the first 2 weeks of infection, we observed stereotypical brain MRS abnormalities. Thereafter we found a divergence in brain metabolic patterns amongst the animals. 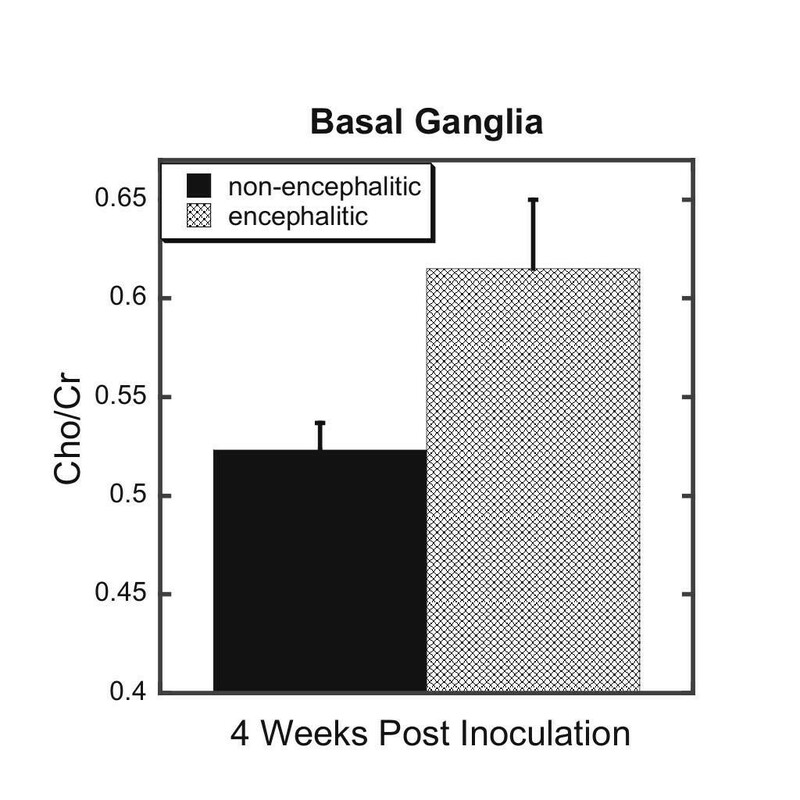 We found that an elevation of Cho/Cr in the basal ganglia four weeks after inoculation identified animals destined to develop SIVE, an observation that may have important clinical implications. Beyond the 2 week post inoculation, we did not find statistically significant differences in metabolite ratios averaged across all 8 animals between baseline and any specific time point. Yet we found a statistically significant positive correlation between frontal cortex Cho/Cr and viral load, and a statistically significant negative correlation between basal ganglia NAA/Cr and viral load. Thus, both elevations of the Cho/Cr ratio, often observed in CNS inflammatory processes, and evidence of neuronal injury, reduced NAA/Cr, were associated with increased plasma viral load. These observations indicate brain metabolic changes in the SIV infected macaque are driven by plasma viral load, and not by time after infection. Our findings that metabolic indicators of both cerebral inflammation and neuronal injury correlate with viral levels in the periphery also underscore the need to employ therapeutic regimens capable of controlling the propagation and trafficking of virus into the CNS. It may also help explain the reduction in incidence of HIV-associated dementia in the era of HAART despite the inability of most of those drugs to effectively enter the CNS. Eight juvenile rhesus macaques (Macaca mulatta) were inoculated intravenously with SIVmac251 (50 ng p27/kg) . Animals were housed at the New England Primate Research Center, Southborough, MA and transported to the MGH NMR Center, Charlestown, MA for imaging. In preparation for imaging, the animals were initially tranquilized with ketamine or telazol and anesthetized with sodium pentobarbital. All animals were housed according to the standards of the American Association for Accreditation of Laboratory Animal Care. Investigators abided by the Guide for the Care and Use of Laboratory Animals of the Institute of Laboratory Animal resources, National Research Council. Animals were euthanized by an overdose of sodium pentabarbitol when they reached terminal AIDS or at the 2-year end point of the study. Postmortem pathological examinations were performed on all animals. The determination of encephalitis was based upon the presence of perivascular macrophages and multinucleated giant cells in the brain and detection of viral nucleic acids by in situ hybridization of three different brain regions, as described below. Each macaque had MRI and MRS performed before infection, and at multiple time points after being inoculated with SIVmac251. All macaques were scanned at 2 weeks post inoculation (11 days post inoculation (dpi) or 13 dpi), 4 weeks post inoculation (25 dpi or 27 dpi), 3 months post inoculation (mpi), 13 mpi, 15 mpi, 17 mpi, 19 mpi and 24 mpi. Since no study of this type had ever been reported, the rationale for this imaging schedule was based on our previous limited investigations of post mortem brain samples [15, 16]. We define 3 time periods with respect to infection: acute (within a month), subacute (between 1 and 3 months), chronic periods (beyond 3 months). Brain imaging was performed on a clinical 1.5 Tesla General Electric (Milwaukee, Wisconsin) Signa scanner with operating system Horizon 5.6 or 8.3, and a linear extremity coil. The MRI portion of the exam consisted of T1 weighted sagittal images, followed by dual-echo, proton-density and T2 weighted axial images. Axial images were used to localize a 1.5 cm × 1.5 cm × 1.5 cm spectroscopy voxel in 3 locations: frontal cortex with the voxel centered on the interhemispheric fissure; deep white matter with the voxel centered on centrum semiovale; and basal ganglia with the voxel centered on the putamen. On repeat imaging, the animal head was positioned as in the previous study using three-plane scout imaging and iterative repositioning. In this manner, voxel placement was highly reproducible. With the exception of a slightly smaller voxel size, the MR spectroscopy protocol was identical to the one employed in multicenter human HIV studies that is characterized by high intersite and temporal reproducibility . After animal imaging, MRS was performed on a phantom containing known concentrations of major brain metabolites (N-acetylaspartate, creatine, choline and myo-inositol). Phantom MR spectral data was employed to assess instrument stability. The protocol uses automated PROBE-P spectroscopy package, which consists of a PRESS sequence (TE = 35 msec, TR = 3000 msec) with CHESS water suppression [35, 36]. All spectra were processed off-line with the SAGE-GE spectral analysis program  to determine intensities of N-acetylaspartate (NAA), choline-containing compounds (Cho), and myoinositol (MI) resonances, relative to the creatine/phosphocreatine (Cr) resonance which served as internal intensity reference. Virion associated SIV RNA in plasma was quantified by using a real-time reverse transcription-PCR assay on an Applied Biosystems Prism 7700 sequence detection system as described previously [38, 39]. Results are averages of duplicate determinations. Analyses of viral RNA levels were performed by Drs. Jeffrey Lifson and Michael Piatak at SAIC-Frederick. We examined frontal cortex, basal ganglia, and hippocampus/temporal cortex by SIV riboprobe in situ hybridization (ISH) for viral nucleic acid, as previously described [19, 40]. The ISH utilizes a DIG-labeled antisense riboprobe provided by Drs. V. Hirsch and C. Brown (National Institutes of Health, Rockville, MD) . Tissues were microwave pretreated and hybridized overnight at 45°C with 10 ng of antisense riboprobe. Hybridized probe was detected with alkaline phosphatase-conjugated anti-DIG antibody using standard immunologic methods. Controls consisted of sense probes, which had been labeled with digoxigenin at the same time as the anti-sense probe, and matched tissues from uninfected, age-matched control macaques. Lymphocytes were isolated from blood and stained for flow cytometric analysis as previously described . Samples were immunoreacted with monoclonal antibodies against human CD4 (Ortho Diagnostics), CD8 (Becton Dickinson), and anti-rhesus CD3 (courtesy of J. Wong, Mass General Hospital) directly conjugated to either FITC, PE, PerCP, or APC. Samples were analyzed using a Vantage flow cytometer and Cell Quest Software (Becton Dickinson). T tests assuming equal variances were used in comparisons between encephalitic and non-encephalitic animals. Prior to this, the validity of assuming equal variances was assessed. Correlations between cerebral metabolite ratios, flow cytometry, and SIV plasma viral load were calculated by regression analysis after adjusting all values relative to baseline measurements. Additionally ANOVA and Student-Newman-Keuls tests were utilized for the determination of trends. This work was supported by NIH grants RR13213 (RGG), NS34626 (RGG), NS30769 (AAL), MH61192 (AAL), MH45294 (EM) and RR00168-39 (N.E.P.R.C.) The MGH NMR Center is also supported by P41RR14075 and the Mental Illness and Neuroscience Discovery (MIND) Institute. We wish to thank Drs. Angela Carville and Elizabeth Ludlage for veterinary care, Ernest Neale for veterinary technical assistance, Elizabeth Curran and Mike O'Connell for pathology support, and Kathy George for flow cytometric analysis. RAF participated in imaging experiments, participated in image analysis and drafted the manuscript. SVW participated animal care and conducted pathologic evaluations. ER helped supervise and conduct imaging experiments, participated in image analysis and helped conduct statistical analysis. JBG supervised and participated imaging experiments, participated in image analysis, conducted statistical analysis. JPK participated in imaging experiments, image data analysis and statistical analysis. MRL helped supervise and conduct imaging experiments, participated in image analysis and helped conduct statistical analysis. JH participated in animal care during imaging experiments, and participated in image analysis. PVS supervised animal care and participated in pathologic evaluations. EM participated in the design of the study, and participated in pathologic evaluations. EH supervised and helped conduct statistical analysis. AAL participated in the design of the study, supervised animal care and pathologic evaluations. RGG conceived of the study, participated in its design and directed its execution. All authors read and approved the final manuscript.